Samsung Global – Korea has started a country wise program under the name ‘Mob!lers’ where in on an average 20 Mob!lers are selected from respective country and given a different experience considering their efforts and contribution towards Samsung Products without any expectations in return. 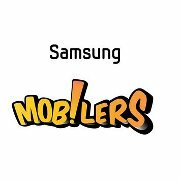 Out of these 20 Mob!lers from each country Samsung selects 2 or 3 best Mobilers and invites them to Korea for the Award Ceremony and also gives them a great experience around their offices and also their partner companies like S.K. Telecom. 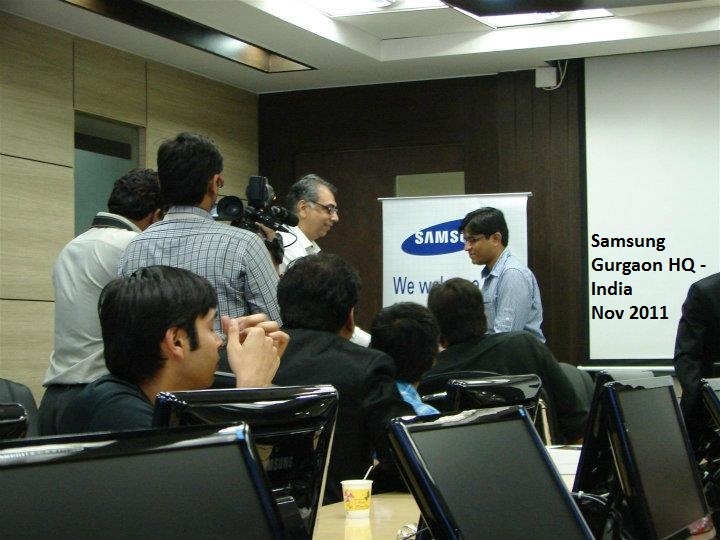 There was initially a small bloggers contest out there with a total of 220 entries submitted out of which 20 winners were announced in the month of November, following which Samsung invited us to their Gurgaon HQ and gifted a Galaxy Tab which i gaveaway anyway. 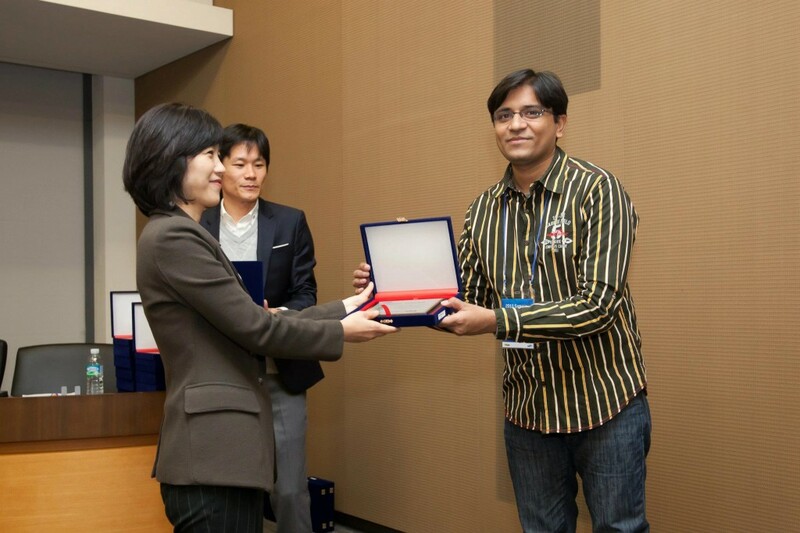 From these winners, me and Mr Arvind Passey were the two Mob!lers who were selected for the Korea Samsung HQ Trip and for the award ceremony. Within a few days i was called by the Samsung Team, announcing that they are inviting me to Korea for receiving the Official Award in Person along with many other Mob!lers from different countries. In the month of December 2011, we flew to Seoul – South Korea where we met 40 other Mob!lers who were not only techies, but also creative guys. The complete trip was as exciting as the Microsoft MVP Open Day 2011 at Hyderabad. 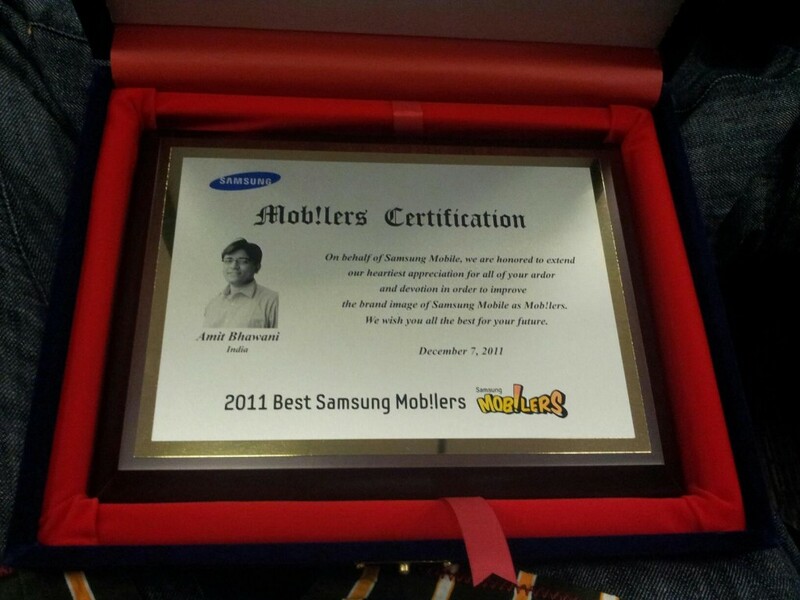 We have had a great time and Samsung gave us a award as shown below. During this trip, Samsung not only allowed us to check out their HQ in Seoul, but also gave us a great experience of Seoul, by taking us to the finest restaurants, S.K. Telecom office, Tour to SK Telecom’s T.um which had some awesome technologies at display and also to the Seoul Tower. Overall this was one trip which i would never forget. PS : Let me inform you that this is a old post which was in the drafts and i didn’t get time earlier to complete it and publish the same.